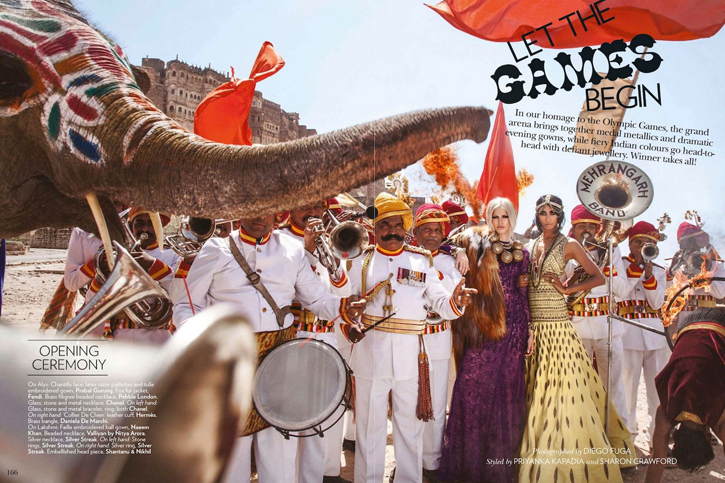 If you've been following me for a while, or even trawling through the pages of tribal/ethnic inspired fashion editorials I've featured on this blog, you'll probably have figured out that I'm pretty much head over heels in love with Indian Vogue. With all that glitz, a myriad of textures, fabrics and patterns and of course those intricate prints in habitually vivid hues, synonymous with an all-Indian approach to style, it's ethnic eye candy to the extreme. This has to be one of my favourite shoots of the month, not just for that luxe bohemian vibe, but because its Olympic themed! And as a supporter of all things time-honoured and global, I thought it only right to feature these fine glamazons in 'Let The Games Begin'. Featuring models Lakshmi Rana and Alys Hale and shot by Diego Fuga for the July issue, its like some kind of fashion-off complete with very sultry posing, of course. I wouldn't say no to anything featured here, particularly those Yves Saint Laurent silk habuti trousers, oh and that camel too. What? With an ensemble like his, it's definitely a stylish way to wander.